Geshe Samten Tsukphu has already visited Yeshe Sal Ling at its inauguration in July 2015, and then again in May and June 2016, when he gave a course of Tibetan on a series of weekends, and in January 2017, when he performed the Gutor ritual at Yeshe Sal Ling together with Lama Sangye Mönlam. Geshe Samten Tsukphu will visit Yeshe Sal Ling again in winter 2017/18, arriving in late December 2017 and departing in late January 2018. 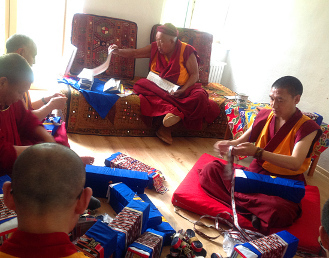 There is the possibility of Tibetan courses, similar to the ones in 2016, on any level. If interested, send Email to tinyflame@rediffmail.com (Sophie). Also, on the occasion of his visits to Yeshe Sal Ling, it is always possible to ask Geshe Samten everything you always wanted to know about the nine ways of Bön, the Kanjur and Tenjur, Sutra, Tantra and Dzogchen, all the texts and rituals, the iconography of thangkas and mandalas, etc. A very erudite Geshe, one of the principal editors of Triten Norbutse monastery's scholarly publications, Geshe Samten is an inexhaustible source of information on all things Bön as well as on the many fine points of Tibetan language. Geshe Samten Tsukphu has been connected with Yeshe Sal Ling from the start: he was - together with Lama Sangye Mönlam and Geshe Nyima Wangyal - one of the Lamas who worked intensively for more than a week on the preparations of the inauguration of Yeshe Sal Ling and the consecration of the Tonpa Shenrab statue.